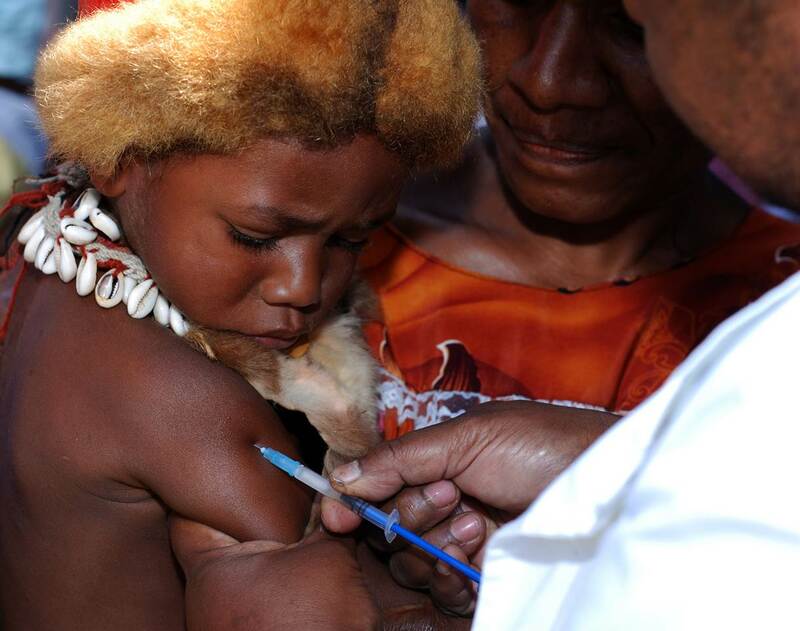 The Papua New Guinea (PNG) Health Ministry and international aid agencies have launched a mass vaccination of 1.8 million women and girls aged 15-45 against maternal and neonatal tetanus (MNT). The tetanus toxoid vaccine will be administered from 2 April to 15 May at public health facilities and schools in all 20 of the country’s provinces. While the Ministry of Health has carried out supplementary vaccination programmes to protect against polio and measles, this is the first large-scale MNT vaccination. Some progress has been made since the government convened a taskforce in 2009 to tackle maternal deaths, but out of every 100,000 live births, some 250 women are still dying, according to a 2008 inter-agency estimate. Some 1 percent of maternal deaths are linked to MNT, according to the UN Children’s Fund (UNICEF). The agency lists 38 countries worldwide where MNT remains endemic, killing an estimated 100,000 mothers and newborns around the world annually. Tetanus is lethal but highly preventable with early diagnosis and prevention through vaccination, say health experts, but figures for MNT-related deaths are hard to come by and the disease is often under-reported. “Data collection has always been a problem because tetanus is mostly present in rural, marginalized communities. Often, the women and newborns die before they reach the health centres and their cases can be recorded,” said Grace Kariwiga, UNICEF’s officer in charge of health and nutrition in PNG. “If 1 percent of maternal deaths can be attributed to MNT, then that would be a good inference of the number of women we can save [with this vaccination programme],” the World Health Organization (WHO) representative in PNG, William Adu-Krow, told IRIN. According to the WHO, tetanus is a disease caused by bacteria commonly found in soil containing manure and its spores are widespread in the environment. Tetanus can grow in wounds if they are not cleaned and treated, or in a newborn’s umbilical cord if it is cut with unsterilized equipment. Pregnant women and newborns are at risk for tetanus before and after delivery, especially in birthing facilities with poor sanitation. Nationwide, 53 percent of women gave birth with a skilled attendant present in 2006, when the government’s most recent national health survey was conducted. Access to healthcare in some provinces is worse than in others. At the time of the 2000 census almost nine out of 10 people nationwide lived in rural areas but the number of health staff in rural facilities declined by 25 percent between 1987 and 2000.